Are you just bored sick waiting for iTunes to offer movie rentals? Yes, you’ve probably been hearing about it for weeks (months?) that Apple is going to offer movies for rent via iTunes soon. I guess, it is just not soon enough. It was a rumor then it STILL is today. Meanwhile, subscribers of services like Amazon Unbox, Movielink and CinemaNow are already enjoying their rented movies on their PCs, Xbox 360’s and Tivos. Yeah, I know, you’re contemplating listing your Apple TV on Craig’s list and trade it in for an Xbox 360 (Halo 3, anyone?). But wait, there is still hope. OK, not just hope. It’s a soon-to-be reality. 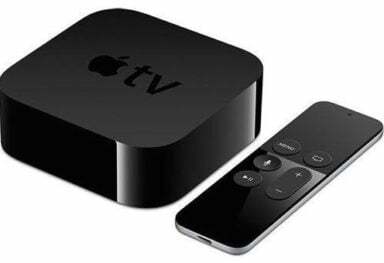 You WILL be able to watch rented movies on your Apple TV very very soon. 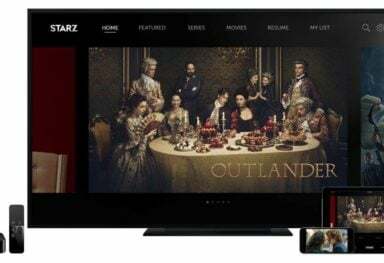 Jaman, a movie download service featuring some of the top movies from all over the globe, is gearing up for the release of their JamanTV player. You might have heard about this application when it was featured on gigaom back in June. In that post, Om Malik wrote about an application that allowed rented movies from Jaman to be viewed right on the Apple TV. And, boy, was he excited about it. However, since then, there had been no update on that news. Then, it happened. Last week, I was given the opportunity to preview the upcoming JamanTV application when the company contacted me to take a look at it. Of course, I jumped on it. I couldn’t have waited another day to be able view rented movies on my Apple TV. 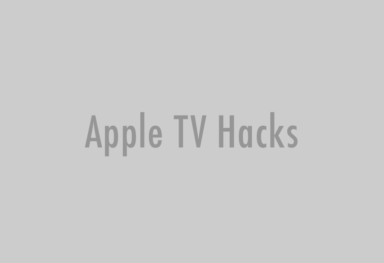 There are two components to getting Jaman movies to work on the Apple TV: the Jaman Player for your PC/Mac and JamanTV player for your Apple TV. 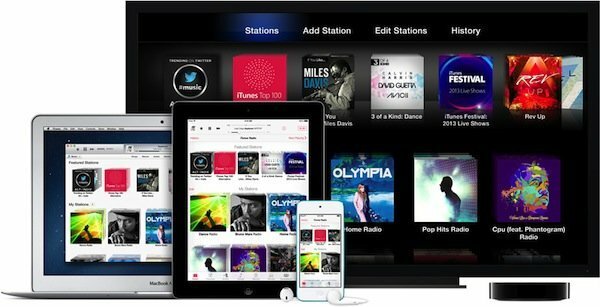 The computer-based player behaves similar to iTunes, in which it manages the downloaded movies and also keeps track of external devices allowed to sync with it. 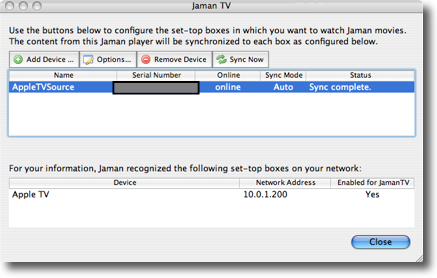 Once the JamanTV player is installed on the Apple TV, it can then be added to the device list to be synced with the computer-based player. The Jaman Player for your computer is publicly available from the site and is actually required to view movies from the service. 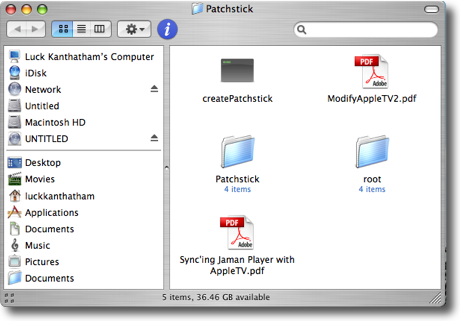 On the other hand, the yet-to-be-released JamanTV for the Apple TV has to be installed via a PatchStick. For those not familiar with a PatchStick, it is bootable USB flash drive that contains scripts for enabling SSH and installing other 3rd party components on to the Apple TV. You can read more about it at awkwardtv.org. Installing the Jaman Player on the computer was a no brainer. It installed just like any application out there. With the player installed, you can log in to the service and start renting movies right away. Installing JamanTV via a PatchStick was relatively simple too. However, there was one major requirement: an Intel Mac. This is needed to run the script for creating the PatchStick. I am confident that this requirement will go away in the future but for now, this is the way it is. A Jaman representative gave me a zip file called Patchstick.zip, containing applications and scripts to create my very own PatchStick. The Patchstick.zip file contains the main install script, createPatchstick, 2 instruction files in PDF and two folders caled “Patchstick” and “root”. Before the install script could be run, the Apple TV 1.1 software update had to be extracted and mounted first. Opening it would mount a volume called “OSBoot” in the Finder. The script needed some files from the “OSBoot” mounted volume to be copied to the Patchstick. I found the two instruction files to be very detailed and informative. Following the instructions in the “ModifyAppleTV2.pdf” file, I managed to run the install script with ease. 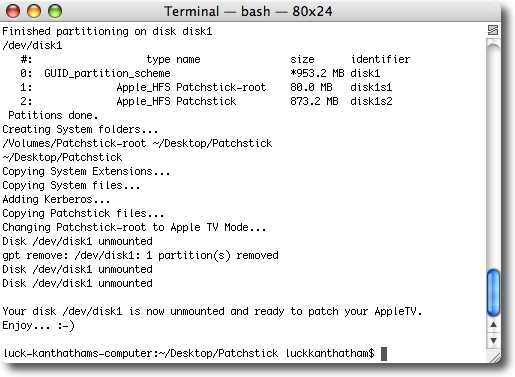 The install script partitioned the USB drive into two partitions: an Apple TV Recovery partition and a regular OS X partition. All the tools and software resided in the Apple TV Recovery partition to be copied to the Apple TV. Just to be sure that the install script was solid, I ran it through about 10 – 15 times. On certain occasions, I ran into a minor glitch in the script. The script used the command “diskutil unmountDisk” to unmount the USB drive. This was not always successful. After changing it to “disktool -u”, the problem went away. Once the Patchstick was created, I plugged it into the Apple TV and booted from it (“menu” and “-” buttons). With the Patchstick connected, Apple TV booted from it and the install script copied necessary components to the Apple TV. 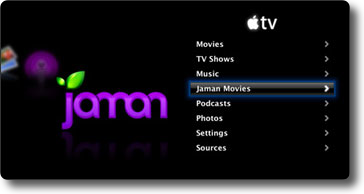 After a couple of reboots, my Apple TV now had a new entry on the root menu called â€œJaman Moviesâ€. At this point, there was just one more step left: adding the patched Apple TV to Jaman Player’s list of devices to sync with. The player required the serial number of the Apple TV for this. The serial number could be obtained from the following sources: iTunes, Jaman Movies menu and Settings menu. 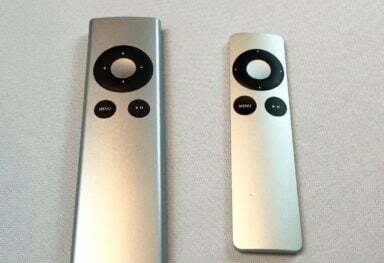 Once the Apple TV was added, the player immediately started the syncing process to transfer the downloaded movies to the Apple TV. It couldn’t be any easier than this. Depending on your network speed, each movie should take only a few minutes to be transferred. However, some movies might take up a few gigabytes of storage. My network runs on Airport Extreme (802.11n) so transferring a few gigabytes of movies did not take long at all. On the other hand, downloading a movie from the service via the Internet took about 40 minutes to an hour. Overall, I am very impressed with the JamanTV software. Hats off to the developers for keeping the install process simple and making the players well-polished. The only thing I would like to see in the future is maybe the ability to preview and rent movies right from the Apple TV without syncing with the PC. Last I heard, Jaman is ready to get the JamanTV out to the public any day now.  Once it is released, you can finally enjoy rented movies on your Apple TV too. I was given the permission to go ahead and post the Patchstick file for download. It is available here.